Welp, I fell off of the healthy bandwagon (I blame 4th of July, World Cup and all the awesome breweries in walking distance of my new house) and needed to get back on track, so it's back to 21DSD, although it's more of a 10DSD mini detox since I'm off to the east coast to visit family at the end of this week. I'm a week in a feeling good, although I learned the hard way yesterday on my run that I need to add the "energy" allotment of a small amount of starchy carbs to my diet. Otherwise, this time around has been a lot easier than the first. I think knowing what to expect and being overly prepared have really helped. Anyway, hubs and I were craving something sweet and I was itching to bake something. 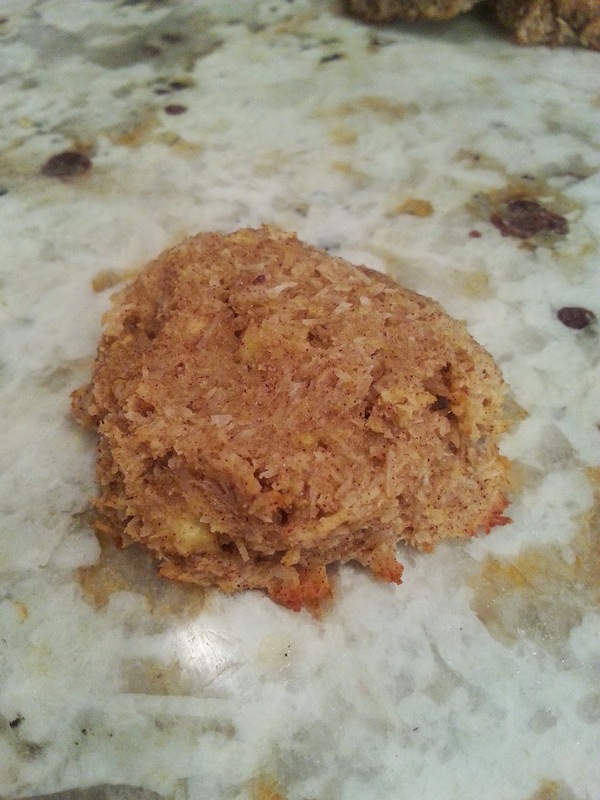 I wasn't in love with the No Sugar Pumpkin Spice Cookies I'd made the last time, so I decided to look for something else. 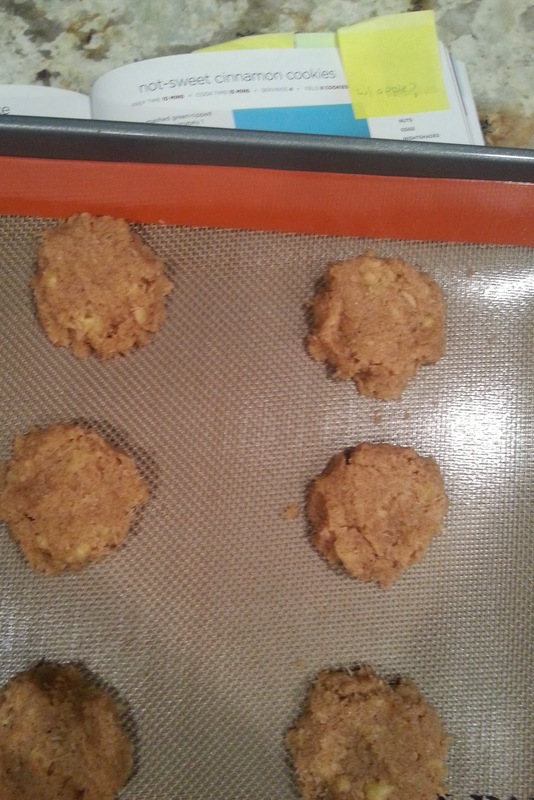 I found a recipe for Not-Sweet Cinnamon Cookies in the 21DSD cookbook that looked promising until I saw it required the dreaded BANANA. Ugh. So instead, I substituted green apple. I was nervous about how the consistency would turn not using banana, but I was pleasantly surprised. 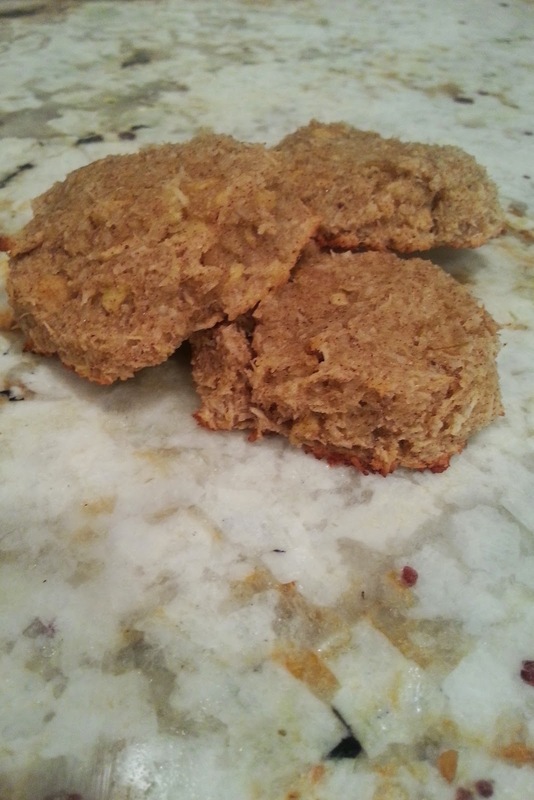 These cookies turned out to be quite tasty and I will definitely be making them again! Maybe with bacon..................stay tuned. Wisk together apple, eggs, oil and vanilla. Sift in the coconut flour and cinnamon and stir until well mixed. Stir in coconut and salt. Spoon onto a baking sheet lined with parchment paper into 9 equal portions and flatten. Bake about 15 minutes. Cool completely on cooling rack or foil.